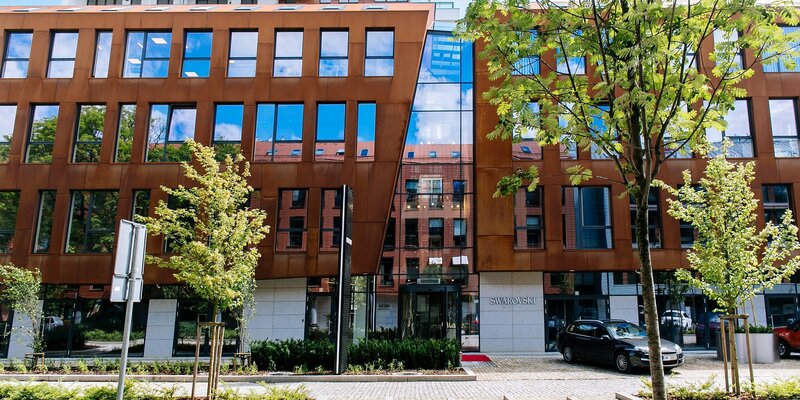 On 12 June, the Yoko Office Building was opened officially in Garnizon, Gdańsk. The celebration was held in the presence of representatives of the investor, Hossa Investment Group, the exclusive lessee, the Swarovski Global Business Services, the local government, and journalists. About 300 employees will work in the office of the Austrian company. Swarovski, leading manufacturer of precision cut crystal since 1895, signed a lease agreement for office spaces in the Yoko building. The office building fulfils all the requirements of Swarovski concerning its new offices in Gdańsk. What mattered was not only the high standard of the building, its exceptional architecture, and availability of parking spaces. The new lessee appreciated the holistic Garnizon investment project, which is being implemented in the spirit of sustainability by Hossa Investment Group. Owing to the number of amenities, the friendly public space as well as its rich cultural and entertainment offer, Garnizon has become an excellent location for businesses that care for the quality of their working environment and want to provide their personnel with balance between work and relaxation. We believe that the positive climate of the site created by Garnizon will contribute to the dynamic development of our Partner in Gdańsk. The process of selecting a location Swarovski’s Global Business Services Hub in Gdansk was conducted by CBREConsulting Agency. The BPO / SSC sector, or so-called shared services, is the fastest growing business in Poland. Companies that decide to open offices specializing in business support of organizations value Polish cities for the high quality of office spaces, expansion opportunities, and in particular the qualified and ambitious personnel. The decision taken by Swarovski, which is an international organization, confirms that Gdańsk fulfils all the conditions for business development on a large scale. Strategic business decisions require comprehensive support, and the selection of a location is a key decision for companies that enter a new market. The analyses and simulations carried out for Swarovski were unique. I am positive that Swarovski will be among the companies whose development we will see in the coming years and that will have a positive impact on the labour market in Gdańsk. Yoko is a high quality commercial facility, with more than 12 thousand sqm of office and retail spaces. The office building at 5 C. K. Norwida street has four storeys and an underground car park for 300 cars. The ground floor is dedicated to a variety of services. The design takes account both of the safety of lessees and ecological issues, including green roofs with a system of water rotation and bike racks. The office building is in a very convenient location, with a range of available services and public transport nearby. It is situated in the central part of Garnizon, a modern quarter that is being built from scratch on more than 25 ha in Gdańsk-Wrzeszcz. This unique project combines harmoniously the residential, office, retail, cultural, and entertainment functions (the Garnizon of Culture). The construction project being implemented in Garnizon, GARNIZON.BIZ, is among the largest in Gdańsk and is to provide about 150,000 sqm of modern commercial spaces.